Next day an He 111 took off at 1630 to provide ASV jamming cover for an Axis convoy and a second left two hours later, both landing in Heraklion; the second of these Wildschwein had jammed two Allied frequencies. Once again two Do 217 night fighters had joined in escorting the ships and although there was a British air attack, they did not contact hostile aircraft. In a somewhat bizarre use of official encrypted channels on the 26th, the Forest Administration in Závadka (Slovakia) signalled the newly-promoted Generalmajor Aschenbrenner that the stag-rutting season was in full swing and invited him to come and shoot them. Back on 18 June, a Fw. Pradel told LN-Abteilung Afrika that Ju 52 KF+UX (W.Nr. 3074) had been repaired. It had evidently carried on flying for on 27 September Pradel signalled the Bardia WIM station that the aircraft’s return to Qotafiyah was uncertain but that its arrival in Bardia would be reported. These flights may have been connected with a decision that a 200-Watt transmitter which was not in use should be sent to the Bardia WIM station. A report sent from “WIM” (which was not stated) via WIM 9 to Flifü Afrika’s Senior Signals Officer said KF+UX had taken off from Bardia at 0615. A week later, on 3 October, Pradel advised that BV+OM (Ju 52 W.Nr. 7338, also of the LN-Abt.) had landed in Derna with engine trouble and that KF+UX would probably be able to fly three days hence. Overnight convoy protection on 27 September was provided by three ASV jamming aircraft (up at 1600, 1920 and 2032), a Do 217 which left Heraklion at 1849 and another from Derna at 1930 hours. Of these night fighters, one was over the convoy from 2015–2140 then lost contact with it after its direction-finding gear broke down; the second landed at 2030 with engine trouble. Three Beauforts were subjected to jamming while operating against a convoy WSW of Crete on 27 September, such that none of them got an ASV contact and only one a visual. Three were three He 111 jammers on convoy duty that night. NOTE: The Beaufort observers' reports left “little doubt that Cretan jammer is the most effective used by the enemy [and] apparently saturates receiver at 120 sea miles’ range [222 km] when aircraft at heights of 100 to 200 feet [30–60 m]”. The characteristics of these transmitters were judged to be different from those in Sicily, not least in their great power. This incidentally was the only ASV strike that RAF Malta could identify as having been thwarted by jamming in the period 5 September–5 October. It is planned to set up a jamming station on the Île de Groix [in the Bay of Biscay] but it will be effective only as far as 65 km from the shore. The Communications Equipment Experimental Command [Nachrichtenmittel-Erprobungskommando] is preparing a stronger jamming transmitter whose range, however, will still be limited. On 29 September, the Air Ministry in London was warning RAF Middle East that Freya and WIM stations were to cooperate in tracking Allied reconnaissance aircraft, immediately passing their plots to fighter and Zerstörer units. The object was, of course, to protect the supply convoys, and efforts would concentrate on the sea areas north of El Daba and in an arc off the western tip of Crete, both lying within Freya coverage. Fliegerkorps X reported its strength on the 30th, not mentioning Kdo. 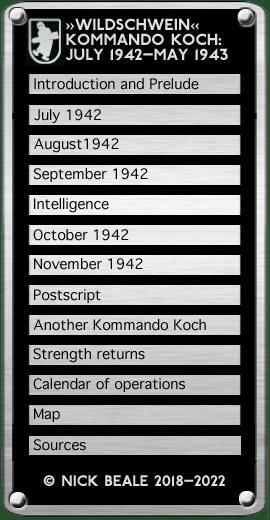 Koch but including “two unspecified units, strength unknown” and a Nachtjagdkommando with 4 (0) aircraft, presumably including the Do 217s. There were two He 111 jamming sorties that night, taking off at 1545 and 2030 hours. The Fliegerkorps issued an account of its ground and air WIM activities for the last night of September. Crete had taken fixes on 11 British ground radars in the 199–206 mHz frequency band and for the first time RAF night fighter radars were detected SW of Crete. Snap bearings had been taken by El Daba, Bardia, Derna and Crete West on no fewer than 14 ASV aircraft, so that the Wildschweine could be given the most productive courses to fly. To supplement the airborne effort, active jamming of ASV had been provided by the Nachtfalter at Derna and Crete West. A local fuel crisis had developed on Crete at the end of September: transport was delayed and there were warnings that operations and convoys escorts were in jeopardy unless fresh supplies arrived. Assurances were given on the 30th that the shortages would be redressed by 4 October. Another sign of strain came in a directive of 25 September that the other ranks establishment of Luftwaffe signals units was to be reduced by 10% since the allocation of new recruits for autumn 1942 and all of 1943 had been blocked. The only exception to these cuts was to be the radar stations. An announcement also went out from the Luftwaffe Operations Staff of a week-long planning conference for the air reporting service, starting on 15 November. Local commands were to send “three of the important officers”, including those actually responsible for carrying out the reporting. The apparatus works through the V.H.F. set by means of special aerials. When these are switched on the pilot can D/F himself onto any aircraft giving out a transmission. At present the gauge altitude from the apparatus. He may be able to get some assistance re altitude from his A.I. but this is usually jammed when close to and behind a “Lark” bandit. When a “Lark” is reported and the probable “Lark” bandit established, Sector will give the fighter a vector to cut off the bandit. If possible they will give the height and course of the bandit and its distance from the fighter. The “FLYCATCHER” Beaufighters must, therefore, be given first priority under G.C.I. control unless it is established that the enemy are using “LARK” continuously. Measures were also underway to increase ground radars’ resistance to jamming and a standard format had been developed for the stations to report times, frequencies, bearings etc.